New research from Bruce Schaller shows that the companies are adding traffic at a prodigious rate in America's largest cities. While ride-hailing companies add options for people to get around without owning a personal car, Schaller shows that the overall effect of their growth has been to jam more motor vehicle traffic onto crowded city streets. Also known as transportation network companies, or TNCs, Uber and Lyft haven’t just supplanted taxis, they’ve more than tripled total for-hire vehicle mileage in the span of a few short years. Most of this mileage is concentrated in the nation’s largest, densest cities, where TNCs compete with transit more than personal cars. Fully 70 percent of Uber and Lyft trips are in nine major metropolitan areas, adding 5.7 billion vehicle miles annually. If cities don’t take steps to curb car traffic and prioritize spatially efficient modes like transit and cycling, Schaller warns, Uber and Lyft will continue to exacerbate urban traffic congestion and weaken surface transit systems. Schaller’s report, The New Automobility [PDF], augments previous research with newly available TNC trip data and thousands of interviews from the National Household Travel Survey. The main conclusion is that TNCs are bound to generate more car traffic in cities for two reasons: They mostly draw passengers who wouldn’t have otherwise used a car, and each TNC trip includes significant mileage with no passenger. Travel surveys consistently reveal that only about 20 percent of TNC trips replace personal car trips. Another 20 percent replace traditional taxi services. The bulk of TNC trips — 60 percent — either replace transit, biking, and walking, or would not have been made without the availability of TNCs. Uber and Lyft have pivoted to emphasize the growth of their shared-trip services like UberPOOL and Lyft Line, but Schaller demonstrates that even under the most optimistic scenarios for shared-ride adoption, the net effect of the services is to generate more traffic than a scenario in which they did not exist. Working against the efficiency of Uber and Lyft is the large proportion of mileage without a paying passenger in the vehicle. For a typical passenger trip of 5.2 miles, a TNC driver travels three miles waiting to get pinged and then going to pick up the fare. Factor in all the Uber and Lyft trips that are substituting for transit and bicycling, not personal car travel, and the net effect of TNCs — even if half the trips are pooled — is to more than double the motor vehicle mileage that the same set of trips would have generated if TNCs were not available. 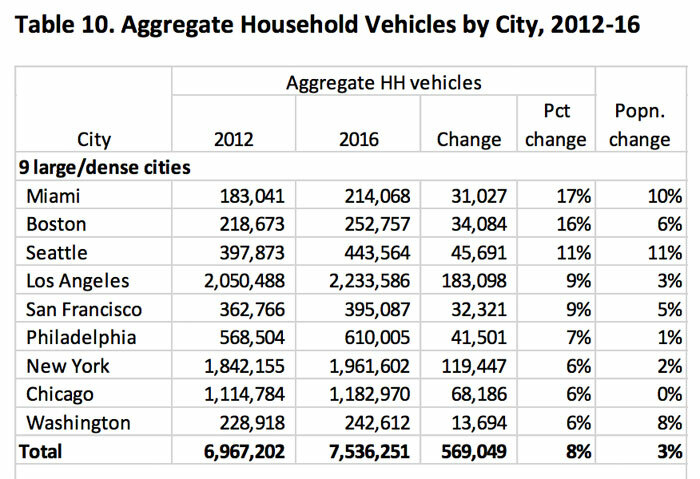 Nor is there any indication that Uber and Lyft are exerting downward pressure on personal car ownership in major cities. In seven of the nine regions where the companies’ services are concentrated, car ownership per capita is on the rise. 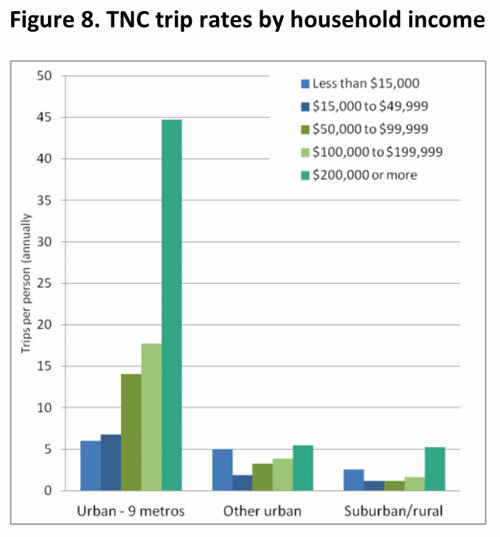 In these nine cities, TNC usage skews toward more affluent residents. It’s an option to bypass buses and trains for those who can afford it. Meanwhile, less affluent residents are left with worse options than before, as skyrocketing Uber and Lyft traffic slows down buses and makes bicycling more stressful. In smaller cities and more rural areas, where transit options are scarcer, poor residents do get relatively more use out of TNCs. But these are not the places where most Uber and Lyft trips are happening. Schaller’s recommendation is not to regulate TNCs into oblivion. Like taxis, TNCs can serve a useful role without eroding the transit networks that cities depend on. But cities and transit agencies have to exert more influence to prevent TNC-generated traffic from spiraling out of control. The momentum propelling the growth of TNCs is powerful and unless cities act, the trend could continue long into the future. By the end of this year, the number of trips in TNCs and taxis will outnumber local bus ridership nationwide. Looking a little farther ahead, Schaller sees a long-term risk in allowing current TNC usage patterns to set the template for networks of shared autonomous vehicles. If AV fleets merely replicate the model of car-sized vehicles carrying small numbers of people, cities are in trouble. To wrest TNC traffic under control, public officials will need to deploy the full suite of policies prioritizing transit and biking relative to driving. Frequent transit service, bus-only lanes, and bike lanes are essential but not sufficient. Congestion pricing can help bend the curve but would have to charge very high rates to make a dent in TNC traffic in central cities. More direct policies to ratchet down car use and traffic, like eliminating parking requirements, setting aside curb space for commercial deliveries instead of private car storage, and diverting car traffic away from major transit arteries in central cities, will be necessary. For Uber and Lyft specifically, Schaller says cities should consider limiting the number of vehicles TNCs can operate in central districts at any given time, or mandating higher occupancy rates, both of which would compel the companies to transport people more efficiently where space is precious. Unless cities want to cede their streets to a modern version of the car-based policies that hollowed out urban areas in the 20th century, doing nothing is not an option. can’t wait til larry littlefield barrel rolls into this thread blaming unions and working wages for this travesty. Good recommendations. I only wish that NYC had spent more time regulating cars and less time demonizing e-bikes, the availability of which could counter some of the demand for car trips. Does NYC have the authority to limit the areas of use of TNC’s? Why cannot picks and drop offs be limited to outside of certain congested areas? Tech could work so that if you have a disability, you could be picked up or dropped off. It makes no sense that able bodied people cannot walk to certain streets to get picked up. This may make transit more convenient, so be it! And when there are emergency road closures, such as 5th Ave for the last few days, create a TNC ban to reduce the amount of traffic! This seems like something that NYC could do without Albany approval, and could make the case for congestion pricing reforms more tangible to naysayers. Restricting ride hail operators in any way in an attempt to reduce vehicle congestion is the wrong approach. Limiting/restricting/putting regulatory difficulties in the way of ride hail applications serves to protect the taxi cab industry. Far better and more fair would be for cities to implement congestion pricing. The goal should be to make trips more expensive for all vehicles through tolls to enter the central business district. Only targeting trips booked through ride hail applications without targeting all other car trips is an uneven, unfair and ineffective way to combat congestion. I support regulation as long as it’s data driven. Lyft and Uber are products of policies driving by politicians saying “A 1000 taxis oughta be enough for our city”. I’d argue that current state of traffic and vehicle availability is better than what we had. Clearly enough people prefer to sit in traffic in a Lyft than drive or take a bus. Cities need to pass laws that are data driven rather than policy driven. For example, decision about a bus lane should fall squarely on factors such as # of buses, ridership, length of delay. Then rather having a bus lane debate about individual anecdotes, we can ask residents to say “I think the we should put in bus lanes once the save at least 4 mins rather than 3 mins.”. Or “Threshold for bus lanes should be 1000 riders per hour rather than 800”. Similarly, Lyft / Uber legislation should be based on metrics taking into account how longer users might wait for a driver, number of idle minutes between rides for drivers that gives us a number that’s adjusted monthly. 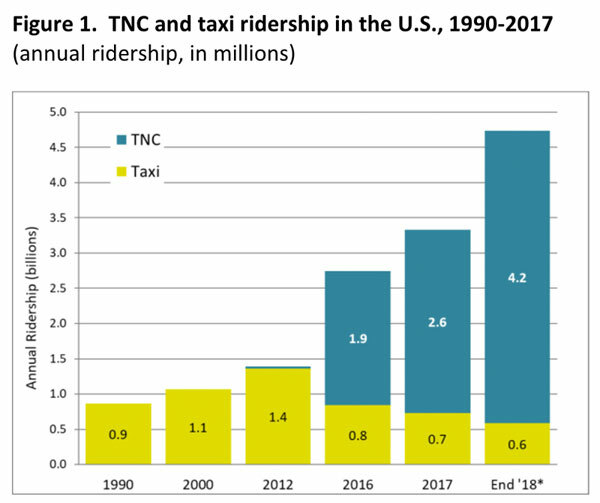 TNC ridership has risen because the economics are vastly distorted; none of them are actually profitable, and even to stay afloat they rely on legal technicalities that rob drivers of protections, benefits, and real living wages. These companies also leech road maintainance resources as they ratchet up vehicle miles in cities. Meanwhile, as the wealthy detach themselves from transit, it’s become riddled with corruption and inefficiencies (like NYS forcing MTA to bail out ski resorts). It’s an absurd notion that getting a personal trip in an automobile could be anywhere near the cost of a comparable bus or metro trip. What will your argument shift to if and when Waymo’s autonomous taxis come to your city? It will be profitable because there’s no drivers to pay. Cities can add a congestion charge to all private vehicles to pay for road maintenance and transit, but road wear is overwhelmingly caused by buses and heavy trucks. Our favorite rubber-wheeled mass transit vehicles cause far more road damage than minivans and cars. Have you checked out the farebox recovery percentage for city bus service? It’s low. Like 10-50%. The remaining 90-50% is a public subsidy. A rider might pay $2, but the city might subsidize $6. The real cost per rider being $8. For $8, Waymo would make money on some trips, and might make money on average if also providing longer trips as well that lose money. If two or more people pool into a shared vehicle, for $16 or $24 the profitability increases while passengers don’t have to transfer or walk as far. In low and moderately dense cities there’s definitely room for this if many or most solo-occupant cars are kept off the roads through high congestion charges. If public bus agencies go autonomous, the numbers shift back in their favor and cities could provide better service with the same budget, but good luck fighting with bus driver unions to put them out of work or replace them with lower-paid bus attendant monitoring jobs. this post well describes the problem of increasing car trips/congestion/transit decline but seems weak about solutions or responses, maybe because in most places nothing effective can be done except accept increasing congestion, pollution, and a decline in transit. Its another “tragedy of the commons” where each acting in self interest leads to an overall system decline. I don;t think there is the political will to do anything about it, not even in NY where congestion pricing is possible and appropriate and there was a significant taxi industry to push back. The market says that they do pay enough because there are a lot of people willing to drive for those companies. Artificial pricing controls simply have externalities that make it more expensive for the user. Likewise, buses spend a lot of time and fuel dead-heading and driving around with few if any passengers. Transit in America is often incredibly inefficient, not to mention inconvenient. 1. Chicago Metra Commuter Rail BNSF line runs an “extra express” on the Saturday for St. Pats day in March. Train breaks down 9 miles from the Chicago Union station, takes 1.5 hours to get another train, not just the loco, but the whole train to pull us into Chicago. Metra engines break down pulling just 9 passenger cars on a regular basis. 2. Chicago CTA EL line: numerous instances of vagrants and frat boy types disrupting the trip. 3. CTA bus from Cubs Wrigley Field during a concert. The #152 Addison St. bus is NOWHERE to be found. The bus tracker app has no trips showing. Coupled with numerous instances of standing like a putz for 20-25 minutes until a herd of 3-4 buses show up. No wonder that people with some income and the aversion to car ownership are taking TNC. I only can afford a flip phone for $20 prepaid every 3 months, otherwise I’d get a smart phone and use TNC experimentally. As for empty TNC driving around, some kind of “storage parking” until a trip is requested should be considered in congested areas. Anyhow, the fact that even NYC is having problems shows you that the root of what’s going on is a reaction to nonexistent or failing transit systems. Why would people in NYC abandon even the subway to pay more money to sit in traffic unless sitting in traffic was proving quicker and/or more predictable than transit? So then charge high rates. But also implement all the other policies suggested at the same time. There is no one easy fix. Do everything at once. The labor aspect is steeped in ideology. I think it behooves all to avoid it for the time being to focus on the fact that with our without your stance on it, the services are absorbing massive government subsidies and are still unable to make a profit. The issue it not the drivers individually, it is the system where the only prospect for financial gain is to maximize the public subsidy and minimize the accountability. As you read ‘The Jungle’ did you also see the family as willfully exercising their rights to ‘make money on the side’? This begs the question: why are we so substantially subsidizing transportation at all? The actual final effect is to increase the distances traveled by all. Is that a public benefit in any way? Would you support an elimination off all subsidies for transport? Should drivers only using the apps for brief times be excluded then? The ability to take customers. Eh? I have no problem with the system in general. But as it is now is simply a race to the bottom supercharged with government money. So yes, I would stop it until private companies start paying for public infrastructure and workers who claim ‘independent contractor’ are forced to pay into a system today which they will be pulling from tomorrow. And just to insulate myself from the logical rebuttal: yes, this should go for public transportation and private automobiles as well. Eliminating all subsidies for transport means through technology or numerous toll booths in every city, everyone pays to use streets and sidewalks, even pedestrians and bicyclists. Tolls are priced to cover 100% of the cost of maintaining roads and freeways. Additionally those unable to pay are unable to travel unless their tolls and optional vehicle costs or full bus fare are paid by other people or organizations. I wouldn’t support that. Cities and society as a whole benefit from transportation subsidies in multiple ways. Bus ridership increases with subsidies, which reduces traffic congestion. The poor are able to get to jobs with affordable transit. Even enabling people living farther from city centers can be beneficial, if most cities had better policies than today. In theory a larger living radius brings down housing prices because the supply of land and housing is greater. If we can eliminate all transport subsidies, we can also implement those better policies for housing. Meh, the market will sort this out. When the streets get so crowded that it’s no longer faster to take Uber, people will revert to taking subways and so forth. If the Bay Area actually had a robust transit system instead of deferring infrastructure upgrades and expansion more people would use public transit. This article, like others with the same theme, like to point the blame at ride sharing companies for adding to gridlock when the problem is that the cities themselves have done little or nothing to address the already existing gridlock. Why spend an hour on Muni to go 3 miles when you can hail an Uber, Lyft or old fashioned taxi and get there in 1/5 of the time. Who is “we?” The “we” who can’t or won’t use these things aren’t benefiting from vehicle availability, quite the opposite. And “state of traffic” is not better, that’s what the research in this article about, so you are arguing individual anecdotes counter to data. Valid points and I respectfully disagree on most of it. Yes, the ‘price’ is a slippery number to get a hold of on an individual basis and seeking to achieve total accuracy is foolish. For example, do you scan in and out on each bus stop? What if you are two pounds heavier than the guy sitting next to you? I’m being sarcastic but you see my point. What I recommend is to improve the funding accuracy on a macro level: Gas taxes (or charging electricity) to pay for road building and maintenance. Registration which actually pays for the ground level space your car occupies and at all times and its weight, bus tickets which fully fund the system, etc…. These exact benefits you claim are exactly what are choking US cities and making the population less productive and, frankly, more miserable. The ‘larger living radius’ is what forces the poor (and the rich for that matter) to be ever further separated from their places of residence, employment and retail. The American Experience of excessive transportation subsidies ‘allows’ the poor to sit on a bus for two hours to get to work. It ‘allows’ neighborhoods to be leveled for parking lots and roadways and it allows the majority of Americans to never consider alternatives to the hour drive alone to and from work each day. Again, it’s a values argument to some degree, but I just don’t see the benefit on the macro scale. Why does Lyft need to be profitable? They use their money as they choose, and if they want to borrow from investors to use for self driving car development, it shouldn’t stop them. Uber has 2000 engineers, and let’s be conservative and say they cost $200K each including benefits and office space, that’s $400 million a year cost. Their revenue is $2.6 billion a quarter. If they weren’t investing so heavily in future projects, they could be very profitable. That’s most of me-and-the spousal-unit’s TNC trips: Restaurants, movies, shopping, beach: all things we would do a *lot* less of if we had to take the bus or a taxi. I suppose that boost to the local economy is less important than reducing street traffic for some reason or another, but I doubt you’d get merchants to agree. It sounds like your criticisms don’t account for what would change if people paid the true higher costs for road construction, maintenance, bus operations, freeway and subway construction and maintenance. If cities got gridlocked with cars, they’d still have the choice of implementing congestion zone pricing to discourage driving alone. Your reply also crucially doesn’t explain in more compact cities where the poor should live, what conditions they live in, how they get and keep their living space, and how they afford getting around when they need to go longer distances and bus rides are unsubsidized? The people are the public who pay for roads with their taxes. In addition to TNC’s negative impacts, my thinking is that autonomous vehicles would further increase traffic congestion and all its negative impacts. My reasoning: autonomous technology will further increase vehicles on our streets and highways as most vehicles will be in use. This means there will be far less vehicles in parking lots. Are our governments at all levels prepared for this on-slot on our limited infrastructure? Uber, Lyft, and other app-based ride services are unequivocally worsening gridlock in the Manhattan core and also slowing down vehicular travel in northern Manhattan and the western parts of Queens and Brooklyn, according to a report released today by transportation analyst Bruce Schaller.